Apple Computer introduced the iMac computer in August 1998. The initial demand for the iMac was very high and Apple sold as many iMacs as they could make. One issue of great concern to Apple was whether the iMac was expanding the base of Macintosh users by new customers or was only being bought by people who already owned a Macintosh. To investigate, ComputerWare asked 500 of its iMac purchasers what computer they owned or had owned. 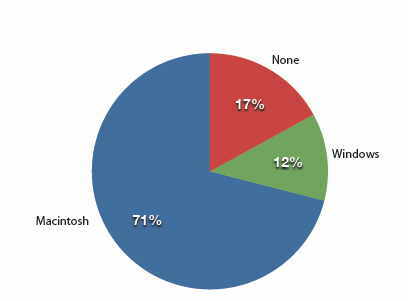 There were 83 new computer owners, 60 who had owned a Windows-based computer, and 357 who had owned a Macintosh. Figure 1 shows the results of a study on who was buying iMacs when the iMac was first introduced. Although most of the buyers already owned Macintoshes, a substantial number of purchases were made by both people who owned Windows computers and people who did notown any computer. This was a good sign for Apple, and the iMac was a big success.